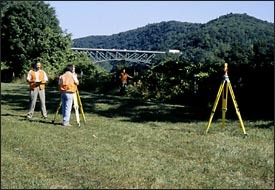 SVE Associates has a full service Land Surveying Department, providing surveying services in New England. Among the services provided are boundary surveys, ALTA/ACSM land title Surveys, aerial control surveys, subdivisions, topographic mapping, construction layout and right-of-way surveys. The surveyors are accustomed to working directly with engineers, architects and the construction industry to supply their specific job needs. The experienced personnel and use of current technology help provide our clients with a quality modern product.